Note: Today we will begin to incorporate our Krav Maga gym into our daily warmup to expose Athletes to a wider range of skills and drills. Instruction on the GHD will take place with each class. Eileen is Athlete Of The Week! 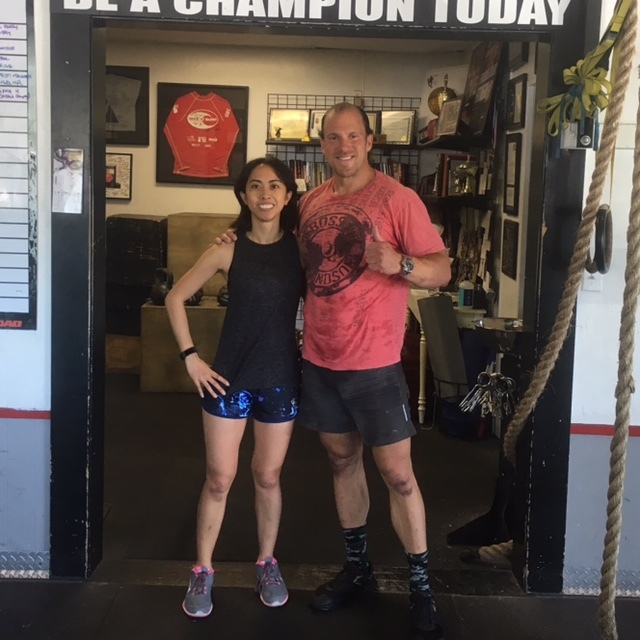 Congratulations to Eileen who was recognized as Athlete of The Week at CrossFit Amundson. Eileen is one of our ever-faithful Saturday morning warriors, and each week, her fitness capacity continues to improve! This amazing woman has strength of someone twice her size, plus an engine to match. In addition to her commitment inside the gym, Eileen is a very accomplished runner, who recently helped lead her team at the 2017 Santa Cruz County Law Enforcement Relay Race. Eileen also has a big heart for service, and when she is not workout out, she works as a District Attorney for our beloved Santa Cruz, where she is highly respected among her co-workers and Law Enforcement Officers. Thank you Eileen for your service in our community, and keep up the inspiring work!